The completed and promoted release of any music, whether it’s a single song, extended play, full album, or recorded live set, is almost never a single individual’s endeavor. Sure, there are plenty of solo artists and “bedroom creators” who do their own leg work from creative conception to publishing. However, for the most part, at some point along the way artists and bands come together with others to get to the finish line. 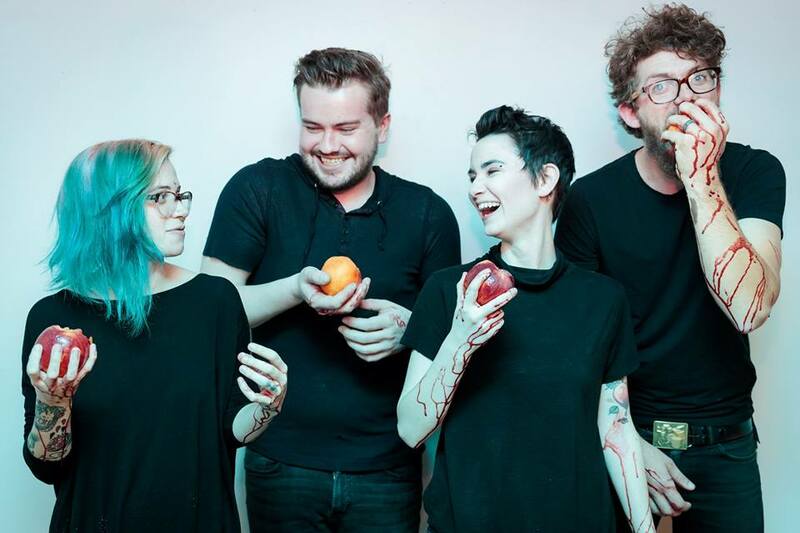 In the case of Alternative pop quartet Necter, and new EP, Bruise Your Ego (independent, 2017), the whole idea of teamwork and highlighting the value thereof, seems to run like a vital artery through everything that makes up the three song release. Known pretty significantly among folks living within the greater Long Island, New York City area, Necter (Brianna Martinsen, Kieran Perdie, Ryan Cullinane, Sam Raia) are no green act. Formerly a duo of just Martinsen and Raia, Necter has a nine track debut LP in the archives already, released last summer just prior to the additions of Perdie and Cullinane. 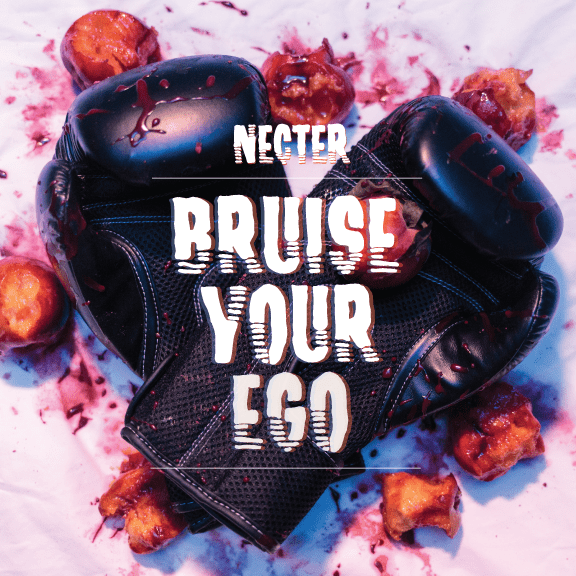 Bruise Your Ego does inevitably represent a sense of newness, as this will symbolize the first finished project showcasing Necter’s new iteration. Nevertheless, understanding the primary desired sound of the band hasn’t changed from then to now, the quartet is in the serendipitous spot of promoting both a fresh start with seasoned stylization – all the new without the jitters! Where things get interesting – and this is well before any of Bruise Your Ego’s actual music comes into the picture – is at the realization that even though Necter aren’t that unknown local band who is just starting out and needs to do 1000 extra things to bring themselves into people’s awareness, with Bruise Your Ego, the group shows they are not about to abandon the energy that locality and community support brings to bands who have yet to establish a reputation. Necter went above and beyond expected standards of 2017 releases and included a hefty amount of credit and liner notes with their EP; thanking a plethora of individuals for everything from recording contributions to simply helping from an emotional place, to get a song to that next level. There’s a prominent sense of localization in the names mentioned – many of them fellow musicians from other bands active in Long Island’s music scene. Talents across instruments for extra backing tracks in the EP’s mix, background vocals, artwork, photography and, of course, recording at local studio, VuDu Studios, make Bruise Your Ego read like a propping up of the Long Island music scene and, if anything, like a boost to the community’s ego. After taking all this collaboration and interconnectedness in, it’s hard not to picture a big group of friends getting together and working hard to make this EP. It’s not often listeners are necessarily prompted to think about the creative process with an album or EP. It’s all about the end game and what one does or doesn’t get from that listening experience. Here this is the case too, to a degree – especially if one isn’t from the local area. Yet, even without those specific connections, the sense of gratitude can be appreciated and taking that along when finally giving the EP a spin definitely doesn’t hurt. Bruise Your Ego is sonically lush but also aggressive. There’s no disputing the foursome’s likening Necter first and foremost to Paramore or finding inspiration from the contemplative and more poetry-esque storytelling of Death Cab for Cutie’s frontman, Ben Gibbard. After the semi-reserved, almost chant style “oh oh oh” hook of opening track “30 Days,” the tonal aggression of brings Necter out swinging with a dense and loud set of repeated power chords that would fit at the onset of any climatic movie scene or at the precipice of any major sporting event. The instant pull back of all that power and intensity during the verses, in favor of stark, echoing vocals, and the abrupt re-flooding of instrumentation at the choruses is a classic alternative/emo/pop rock approach. Though tried and true, the execution is no phoned-in bit of tracking on anyone’s parts. A notable but not excessive amount of delay and reverb coats the lead vocal during most of the EP, which enhances the sense of grandiosity and the overall impression that Necter has a big presence not meant to be contained. This mentality can translate to literal sound or perhaps how the band members see themselves within this new form, and-or Necter as an entity in the musical world, or maybe both. Either way, a common plug-in enhancement can definitely take on broader significance. The one quirk that stands out early on this EP, lies in the vocal melody of “30 Days.” Though written with an easy to follow minor hook, the middle of the song reveals a few very unexpected raised thirds amidst what is an otherwise minor scale. Perhaps such moments are flukes but the ability to briefly consider use of the Aeolian Dominant scale (Mixolydian b6 for those in the jazz crowd), in approachable alternative pop, is thrilling. Introspective rumination forms the very pulse of Bruise Your Ego’s lyrics. Reflecting on a past series of events, a past relationship, or the specifics of past feelings, the generalities of these stories are vague but once even a single line of lyrics comes sharply into focus, Necter look to grab imaginations by the fistful and really get specific, sensory heavy metaphors and descriptive adjectives or nouns instilled into the mind. You could have walked miles for me / instead of glueing your eyes to a screen / Now all your words are falling like leaves / But they’re in piles and filled with disease. Interestingly, the second lyrical excerpt is probably one of the more graphic heard on Bruise Your Ego but the melody to go with it and the rest is conversely, probably the most assuredly positive. The chord progression from the verse to the chorus, to the end of the last refrain, morphs from edgy minor, to major, and resolves at the end of the choruses exactly where many are liable to expect it to, even upon the first listen. The sound to lyric contrast is especially prominent there, and consequently, leaves the EP ending by giving a strong conceptual punch and ultimately leaving a happier impression than might have otherwise been the case if the melody had been prominently and unwaveringly minor to boot. 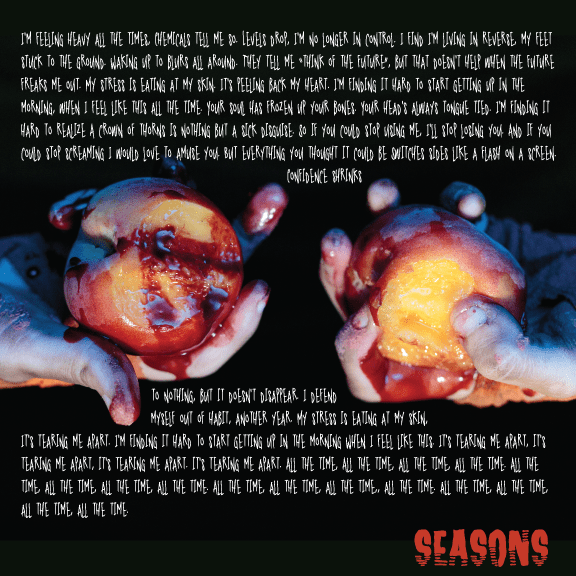 Seeing as one of Necter’s tag lines is “We like making happy songs about really sad things,” this closer, titled, “Seasons,” appears to epitomize that aim in spades. Even though Necter claims they “want to go back to the time [they] paid to make you stay on an island,” Necter definitely knows no band is, or can exist, on an island alone and Bruise Your Ego is a shining example of what happens when a band embraces that knowledge with enthusiasm. Bruise Your Ego will be released on Wednesday, 1 November 2017. Find it on Bandcamp. Necter will celebrate with an EP release show at Katie’s of Smithtown.